Event: 4.4K Run – 4:44 p.m. or there about Tuesday Thru Thursday AFTER LABOR DAY. Location: Anywhere in the World - Run 4.4K (2.73 miles) at a location of your choice (treadmills not allowed.) All times sent via email to rkeel@mindspring.com no later than September 7th will be included in the placing. Be certain to send name, age, location, gender, and finish time with results. Results will be posted at www.cloverglove.com. Entry Fee: $20 early registration by 8/27/19 includes shirt. Preregistration no shirt option $16. 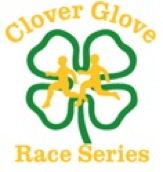 Awards: Points in Clover Glove, Black Bag and Run & See.